One thing I do not get enough of in my diet is fish. Mainly, I blame the fact that because I live in the Midwest, and there are no oceans nearby. Fish is expensive, and honestly, given the choice between a steak or fish, I will always choose the steak, hands down. This recipe looked really good, and I haven't cooked much with fish, so I thought I would give it a whirl. It turned out pretty good! I made 4 filets, and that was plenty for my sister and I. Here is the original recipe. 1. Combine the spaghetti sauce and garlic and heat on medium on stove top. 2. Stir in the half and half. 3. Rinse and dry the tilapia fillets. Set aside. 4. Take 3 separate bowls and line them up in an assembly line fashion. In the first bowl, combine the flour, salt, and pepper. In the second bowl, beat the egg. In the third, pour in the Panko and any seasonings. 5. Dip a tilapia filet into the flour, and coat it thoroughly. 6. Next, dip the filet into the egg, covering it completely. 7. Finally, cover the filet in Panko bread crumbs, pressing them on until they stick. 8. Heat a frying pan on medium heat and add a little olive oil. Add each filet into the pan, and allow to cook 3-4 minutes on each side, until crispy-golden. 9. Spoon tomato sauce over filets and grate Parmesan over the top of each for garnish. One thing you must know about me is that I love French. The language, the culture, the food, the people, the country...well, you get the idea. I started taking French in high school and absolutely loved it. I had really great teachers: Madame Schumacher and Mademoiselle Koepke. They really made learning the language fun, because we also learned about French culture through activities, videos, songs, food and field trips. It is truly because of them that I love French. I immersed myself watching French movies, sought out French books to read for fun, and became co-president of the French club with my friend Paula. It was official--we were Frenchies for life (FFL). My home room teacher, Dave, also spoke French, and we would often converse. So much of the English language is made up of French. I never studied abroad (and that is probably one of my biggest regrets in life), but my dream was to one day go to Paris. In college, I continued to take French. I figured, heck, I've studied it for 4 years, why not continue on? My professors were Madame Rusterholz, Madame Klein, and Madame Poulton. I really lucked out again, as they were all fantastic teachers, and I learned so much during the course of my studies. I really refined my writing and speaking skills in college, and even now when I look back on papers and essays I wrote and tests that I took, I'm like, damn! I am pretty proud of how far I have come, and my proficiency in the language. I also bonded with some other French speakers in my classes, and we would hang out occassionally and talk about all things French. True Francophiles (people who love French)! I did a lot of traveling during college for various volunteer opportunities, and anytime I would hear people speaking French out in public, I would slightly swoon, and eavesdrop on their conversation. I gained a French speaking penpal also, David, who I absolutely adore. He lives in Montréal, and I met him through volunteering for a global organization. Beyond the classroom I never really had much of a chance to practice speaking French until one day when I was offered the opportunity to do an internship for the World Federation of Hemophilia in Montréal, Québec. I moved to Montréal for 3 months of summer in 2007. It was such a great experience. Dave once told me that, "If Chicago and Paris had a baby, it would be Montréal." He was so right about that! It is the perfect combo of both cities. I lived in a really amazing apartment in the Plateau, which is a cool, hip area that a lot of both French and English-speaking students live. I actually got to speak French when I rode the bus, went shopping, attended church, and ordered food. It was awesome! The French I learned in school was different from the French Canadian dialect, but overall I could get by. And of course, David was a fantastic tour guide of his home, and we went on many adventures--including taking a trip to Québec City to see Cirque du Soleil! I also had some special visitors from the states while I was living there, including my French professor, Mme. Rusterholz! Here is the blog I wrote while I was living there, if you are interested at all in reading it. It's fun to look back on and see where I was in my life at that point in time. My, how I have changed (and in some ways, haven't changed at all). After I graduated college, I had an upcoming trip to Paris, Istanbul, and Amsterdam. I was definitely most stoked about Paris, because I knew it would be a dream come true. And it was! I totally did all of the tourist-y things that Americans do there, and saw the Eiffel Tower, the Arc de Triomphe, the Champs-Elysées, the Seine, the Louvre, and Notre Dame. I ate chocolate croissants every day for breakfast. I also tried snails and frog legs, and they were actually pretty good! And contrary to popular belief, not a single French person was rude to me or my friends. Now granted, I also spoke French fluently, so that was not an issue, but that's one piece of advice I would give to any world traveler. Take the time to research the place you are going to: culture, traditions, what not to do, and learn a little of the language. People really appreciate when you have made an effort to learn about their home and culture, and it shows respect. My only complaint about my trip to Paris was that it was too short.There are still things I want to see that I didn't have time for (the Moulin Rouge and Sacre Coeur, for example). Perhaps on my next visit! Currently, I get to speak French at my job, as I take care of our French-speaking customers, whether they are placing an order or need help resolving an issue. That is pretty cool. I had a few French-speaking co-workers, but now one works in a different department and the other one moved away, so I am all that's left! I have increased my French vocabulary immensely learning about words for party supplies and costumes. I love it, and it definitely keeps my brain from getting rusty in the French language. So apparently, I am really hooked on crescent rolls lately. Here's another tasty recipe I found on, you guessed it, Pinterest. I added my own flair, but here is the original recipe. 2. Lay out parchment paper on a cookie sheet. Roll out crescent dough, and spread a little bit of pizza sauce over each crescent dough. 3. Lay 4 or 5 pieces of pepperoni onto each crescent dough. Cut each string cheese stick in half, and place one half on each crescent dough. 4. Sprinkle a very tiny bit of garlic powder onto each crescent dough. 5. Roll each crescent dough up, sealing edges as best you can. 6. Heat butter up in the microwave and brush over the tops of each roll. 7. Sprinkle bread crumbs over the top of each roll. 8. Sprinkle grated parmesan cheese over the top of each roll. 9. Pop into the oven for 15 minutes. 10. Remove from oven. Heat up remaining pizza sauce and serve with pizza rolls. 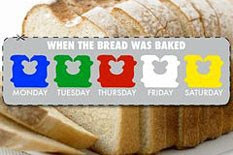 The color of the bread tie indicates what day of the week it was baked? They are also in alphabetical order by color: B(blue), G(green), R(red), W(white), Y(yellow). I have given you some tips on traveling, but I want to spend a little time sharing some practical trip planning tips. When it comes to cheap traveling (flying especially), I guess you could say I am a bit of a pro. -Read the news. Often times, news sites provide information on the best deals on airfare. -Sign up your email on Airfare Watchdog. You can just sign up and get email alerts when there are great deals flying from your area to various destinations, or if you are looking for a specific flight from city X to city Y, you will receive a notification of low rates. This is good for those trips a bit far out. -If you are booking a flight, check out flight prices on Bing's Price Predictor. All you do is enter in the dates you are traveling, and your cities, and it actually will let you know if you should wait to book your flight because prices will be dropping, or to book now, as prices will increase. It graphs out what the prices have been like in the past, and bases its predictions off of that. It's actually very accurate, and great for those last minute trips! -Search out flights Monday through Wednesday. Those days tend to be the days most airlines have sales on flights. Prices tend to jump up Thursday through Sunday, because of weekend travel. -Buy early, or buy late. If you buy early (4-6 weeks or more), you are more likely to save money. If you buy late (less than 4 weeks), you may have limited travel times, but could find some cheap deals because the airline is trying to fill up those last couple of seats. -If you are flying from or to a smaller airport (for example, Providence, Rhode Island), you might be better off flying out of/into a bigger airport that's close, and then having someone pick you up or take a train. I used to fly into Boston, then take the train to Providence. It took me longer to arrive to RI, but I saved anywhere from $100-$150. -Don't be afraid to shop around. Even though most online travel providers have comparable prices, you might find a better deal on one versus another. -Be flexible. Experiment with different dates and times around your trip. If you are able to choose a different day to depart or return, it might mean the difference of saving $100 for flying out on a Thursday instead of a Friday. -Sign up for frequent flier mile programs on EVERY airline you fly. It's free to do it, plus if you end up flying one in particular a lot, you may gain elite status, and earn enough miles to have a free flight or other cool prize! -Dress up a little, but be comfortable. Studies show that you are more likely to be treated better and taken more seriously if you look presentable than if you are in your sweatsuit finest. -The flat tire or "2-hour" rule: If the day of your flight you happen to miss your flight because you were late due to circumstances beyond your control, call the airline immediately and tell the airline attendant it was because you got a flat tire, weather delay, accident, or traffic delay on the way to the airport. Most airlines have a "flat tire" unspoken rule and will try to get you at least on standby on the next flight as a courtesy, without fighting you on it, so long as you re-book within 2 hours of your flight's original departure time. This rule is not advertised by airline employees, but they can bend the rules from time to time. What tips on low cost traveling do you know? This recipe is so easy and delish, you'll be kicking yourself for not having thought of it sooner! Seriously, I would, but I bruise easily, and that is somewhat frowned upon. Here is the original recipe. 2. Serve with apple slices (or a fruit of your choice). I don't know why this particular batch turned out kinda lumpy, but if you use a mixer, it will come out much smoother. Also, for less sweetness, use 1/2 cup of brown sugar instead (the color will also be lighter). I kept seeing this recipe all over Pinterest, and decided I needed to try it out and see what all the fuss was. This is a great snack for a hot day. I got this recipe from One Good Thing by Jillee. All you will need for this cool treat is yogurt, a ziploc bag, and a cookie sheet. 1. Scoop the yogurt into a plastic bag. Not too much--a little goes a long way! 2. Snip a very small hole in the bag's corner, so that you can pipe the yogurt through. 3. Pipe small yogurt dots onto a cookie sheet. Place in freezer for 1 hour. Enjoy! This was really yummy, but on a hot day, it melts fast so eat up! When I travel, it's pretty hard for me to reduce the amount of things I want to bring. Over the years I have learned some pretty great beauty hacks. I got a few of these from Elle See's blog. -Use hair conditioner for shaving your legs, armpits, etc. It's cheaper than shaving cream, and will leave your legs smooth. You can also add a bit of water to the conditioner and spray it on your hair for a detangler. -Run your brush under water and shake it out. The small amount of moisture will de-frizz your hair as you brush it. -To make a DIY lemon facial scrub on the go, ask for a lemon slice and a packet of sugar on your flight or at a restaurant/bar. Mix the lemon juice and sugar together in a cup and apply to your face and lips, avoiding the eye area. Rinse off and moisturize, and you will feel refreshed! -To get rid of a zit, apply toothpaste to it before bed, or crush up aspirin and add water to make a paste and apply it to the zit. Let dry. Rinse away in the morning. If your zit has popped, apply some Visine to it to diminish redness. -Gently rub an ice cube around your eyes to get rid of under-eye bags. Also, a tea bag that you have used in your tea works well to reduce puffiness. Lay one on each eye for 15 minutes, then remove and discard. 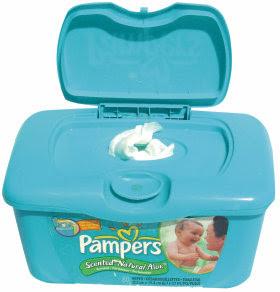 -Take some baby wipes with you and use for removing makeup, getting rid of deodorant stains, or just swipe on your face and hands for freshening up after a long flight. -Use a little chapstick for: rubbing on heels to prevent blisters, softening cuticles, taming unruly eyebrows, moisturizing cracked knees or elbows, and helping with a stubborn zipper. 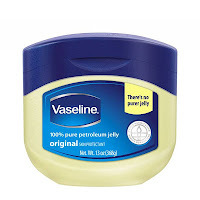 -Use a bit of lotion as a de-frizzer for your hair, or as chapstick if you don't have any. -In a pinch, you can use a bit of lipstick as blush (be sure to blend well!) Also, add a little water to your makeup brush or Q-tip and turn eye shadow into eye liner. 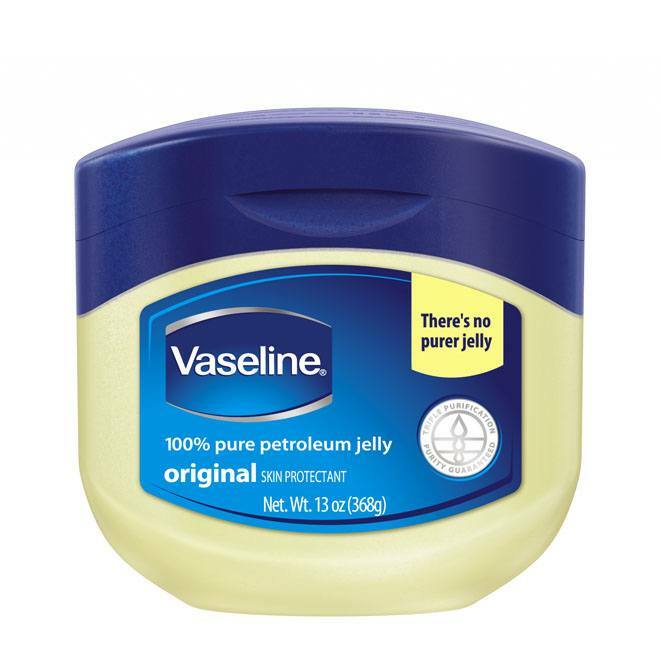 -Vaseline works great as a lotion or chapstick, taming eyebrows, and making a matte eyeshadow shiny. -Take clear nail polish with you. Great for stopping a run in pantyhose, a quick mani/pedi fix-up, applying over a button to keep thread from loosening, keeping an eyeglass screw in place, and making a jewelry piece shinier. -Nail clippers are a must, but are also useful for trimming loose or dangling threads on your clothing. -Don't have a lint roller? Use the sticky side of a pantiliner or pad to remove lint, hair, and fuzz. -In lieu of a curling iron, French braid your hair after the shower and sleep on it. 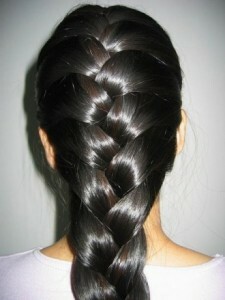 In the morning, take the braid out, and gently finger comb your waves. -Anything you may have forgotten, ask for at the front desk. They often have toiletries and mini sewing kits if you have need of one. What travel beauty hacks do you know? I just love facial scrubs. 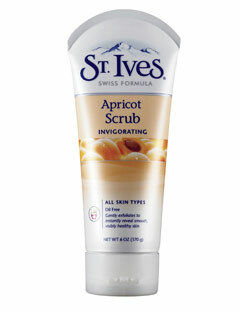 My favorite store bought one is hands down St. Ives Apricot Scrub. It's just abrasive enough to clean off all the dead skin cells and clogged pores. Some scrubs I have tried just aren't "rough enough," and don't even feel like much more than a normal cleanser. I like a little bit of abrasion, once a week. Don't scrub too hard, as the abrasive scrub itself will do the trick. I also like to make facial masks and scrubs out of common kitchen staples. Mrs. Doubtfire knows what I am talking about. Some are good enough to eat! I actually halved the original recipe to get this one, because a little goes a long way. Even this amount is a bit much, so you can have some friends over and get a good 3-4 masks out of the mix. 1. Pour sugar into a bowl. Stir in the honey and milk (the more you add, the looser the consistency will be). 2. Gently pat mixture onto skin, avoiding eye area. Leave mask on for 15-20 minutes. Unlike most masks, this one will remain sticky and tacky, and will not harden. 3. Gently rinse the mixture off using lukewarm water. Clean extra well around hairline to avoid sticky clumps! 4. Apply moisturizer to finish. To make bananas last longer, take them apart from the stem when you get home from the store. 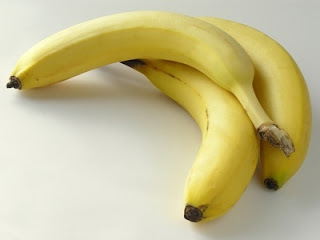 If left together, they will ripen faster. I got this recipe courtesy of Tender Crumb. I altered it slightly, by using only regular flour, and using less chocolate chips (didn't have a big enough bowl for 2lbs!). Amazingly good! 2. Combine the sugar, brown sugar, and butter well. 3. Mix in the eggs next until well blended. I didn't have a blender, so this took a looooong time. Hey, it's on the wishlist. 4. Mix in the vanilla, salt, baking powder and soda, flour, and chocolate chips until well blended. 5. Form dough into round balls (As a note: If you make them smaller, you will come out with about 8 dozen...just sayin.' I made larger ones and got 3 dozen out of the batch). Line a pan with parchment paper. Spread out rounded dough evenly on cookie sheet. 6. Bake for 20 minutes, until edges are golden brown. These cookies turned out really amazing. Hands down the best I have ever made myself. And man, they sure didn't last long! We have all been in a situation in which we were a customer, and the product or sevice that we expected to receive was not exactly great. I work in customer service, so let me assure you, I have seen it from both ends. The bad customer service experiences tend to stick with us for a long time. Often times, we end up moving on and never going back to that company. This Little Rascals bit always reminds me of that, and makes me laugh. Luckily, I have only had to write a letter of complaint twice in my life, but I believe it's something you should definitely know how to do well. What's to say that same thing wouldn't happen to someone else in the future, or happen to you again (if you even decide to stick around as a customer!) So whether it's a bad restaurant experience, a rude airline agent, or a difficult hotel manager, make your voice heard. There's no reason to not get what you have paid for, whether it is a product or service. You don't have to just accept it! Like Twisted Sister says, "We're not Gonna Take It!" I recently had an experience where I was doing a speaking engagement in New York City, and the hotel manager where I was staying at was giving me a really hard time. When I checked in to the hotel, the woman at the desk asked me for a credit card for incidentals. I politely told her I didn't have one. I always do this, because most hotels will charge on your credit or debit card an incidental fee ranging from $50-$200 per night. You get it back upon checkout, of course, but I don't feel it's right to have to pay that if you aren't going to be charging things to the room anyways (movies, mini-bar, room service, etc.) I would have to say that 99% of the time I am in a hotel is for sleeping/showering purposes only. I am usually so busy in meetings, I don't even have time to turn on the TV. So, I explained to the desk woman exactly that, and that I didn't plan on incurring any additional fees. (And let's be real, why couldn't they just put that on the card that was paying for the room anyways?) The desk woman was very nice and understanding, but didn't know what to do, so she got her manager. The manager, however was not so nice and understanding. After the woman explained the situation, the manager gave me a look of disgust and told me, "You probably won't be able to stay here." I was like, "I have never had a problem before. Usually the incidental charges are just turned off." The manager proceeded to tell me that I would have to pay in cash. I looked at her and asked, "How much is the fee?" She responded, "$200." I said, "I am sorry, but I am not paying for a service I won't be using, even if I would be getting my money back the next day. You have my word that I am hardly even going to be in the room, much less using it for anything other than sleeping." At this point, the manager copped even more of an attitude, and asked the desk woman to call a higher up manager, all the while making it clear that this was a huge inconvenience. The desk woman was very apologetic and said if it was up to her, there wouldn't be a problem. It all was resolved in the end, I didn't have to pay anything, but the manager made sure to inform me in a tone that resembled a teacher scolding a naughty student, "Don't even think about using the mini bar or restaurant." I thought, Oh, trust me, I don't want to give you ANY money after the way you have treated me! The situation was eventually resolved, but you best believe that woman helping me had to talk to the head manager, as well as the person in charge of the group that was paying for my stay. Was that all seriously necessary? Maybe so, but there is absolutely NO excuse to treat a guest the way that manager did. As soon as I got home, the first thing I did was submit a letter of complaint to the Better Business Bureau. I am not trying to get that lady fired, or get something for nothing. I just want to ensure that doesn't happen to someone else in the future. The manager will probably just get a slap on the wrist, if anything. I requested that the group receive some sort of discount off of the bill for the way I was treated, since I wouldn't be returning to that hotel ever again. I will keep you posted if I ever hear anything back! I hope that never happes to you, but if it does, here are some tips to keep in mind, and a sample letter that you can edit or use as a template. -Don't wait longer than a few days to write it. If you are traveling, or something has delayed you in writing the letter, indicate so. Otherwise, it would appear that if the event happend 2 weeks ago, why did you wait so long to write a letter about it? -Make sure to keep a copy for your records, and sign and date the original letter and send it. -Include all of your contact information: Name, email address, the best phone number(s) to reach you at and best time to reach you, and address. -Leave emotion out of it. State how you feel, but stick to the facts. -Don't use curse words, be sarcastic, or threaten anyone. Remain courteous and professional in your tone. -Keep it brief and to the point, as much as possible. Try not to exceed 1 page. -If the letter contains enclosures (receipts, invoice, etc), include the word Enclosures (#) underneath your name and title (if applicable). Also, send copies of enclosures, not originals (in case the letter gets "misplaced" or lost in the mail). -In the first paragraph, state the problem. In the second paragraph, state how you would like the situation to be resolved. The last paragraph should thank the reader for their time, emphasize that you look forward to hearing from them soon, and also give them a reason why it would be in their best interest to grant your request (for example: importance of maintaining a good reputation, keeping you as a customer, or appealing to their sense of justice). I was in New York City for a speaking engagement on the evening of Saturday, May 5th, 2012 and the group that was sponsoring the event was funding me to stay at the Bentley Hotel. When I was checking in around 10:00 am, I was asked to provide a credit or debit card for incidentals, which I understand is standard protocol for any guest. Unfortunately, I do not have a credit or debit card with me when I travel--I only carry cash. I explained this to the woman helping me at the front desk, and she was very pleasant and helpful. She did not know how to handle the situation, so she called her manager over and informed her of the situation. The manager responded in a most unprofessional way. She informed me in a condescending tone that I would probably not be able to stay at the hotel. The manager then proceeded to tell the woman helping me to call a different hotel manager, all the while making it seem like this was a huge inconvenience to her personally. When I asked questions of her, the manager gave me short answers, as if the information should be obvious to me. Later on in the day, that same manager refused to acknowledge my presence or assist me when I approached the desk. She deliberately avoided eye contact and moved to the other end of the desk to avoid dealing with me, even though other desk workers were clearly busy with other guests at the time. I don't feel as though I should have been treated differently than any other guest simply because I was not using a credit card. The situation ended up being resolved by a male manager, who agreed to waive the incidentals fee. He was very courteous and understanding, and most importantly, he worked with me to come up with a solution that worked for everyone. However, after a long morning of traveling, it was distressing to arrive at your hotel and be treated unkindly for something so trivial, and furthermore, something I have never had an issue with at any other hotel I have ever stayed at previously. It is, unfortunately, an experience that will not soon be forgotten, but can still be forgiven. I would like you to discount the total hotel bill for the group that paid the amount in full by at least 25%. Good customer service is not something that should be taken lightly, especially for a hotel wanting to uphold a good reputation. Thank you for taking the time to read my letter. I travel frequently, and would like to be able to recommend your hotel to colleagues, due to the way you treat your guests and handle difficult situations that arise. I look forward to your reply and a resolution to my problem, and will wait 2 weeks before seeking help from a consumer protection agency, such as the Better Business Bureau. Please contact me from 9a-5pm CST via phone: (414) 807-8462 or email: shelly.mattson@hotmail.com. I've never made this before. In fact, I feel like most of my recipe posts should start out that way. I like to try new things and experiment. I pretty religiously stick to the original recipe, but Josh is my spice man. He's always like, "You know what would make this taste even better..." and then he thinks of like 8 things to add. Granted, that's never turned out a bad recipe (so far). As usual, I put my own spin on this classic meal. 2. Rinse the peppers thoroughly under cold water. Cut the tops off of each one, but do not throw away. Set them aside. 3. Using a spoon, or your hand, remove the seeds and innards of the pepper, and throw away. 4. Bring a pot of water to a boil on the stove top. Once it is boiling, turn heat to medium, and boil peppers for 2 minutes. After 2 minutes, remove peppers from heat, and rinse under cold water. This will soften the peppers slightly, in case they don't cook all the way through in the oven. 5. Place cooled peppers into a baking pan. 6. In a frying pan, add olive oil, turn the burner to medium and brown the ground beef. Once browned all they way through, rinse meat in a strainer under warm water to remove fat, and set aside. 7. Cut up the tops of the peppers into small pieces, and do the same for the 1/2 onion. 8. Add more olive oil to the pan, and add the veggies and corn. Cook on medium heat for 4 minutes. 9. Turn heat to low and add meat, tomato sauce, tomato juice, and 1/2 cup mozzarella cheese to the pan, and stir until thoroughly mixed. Add salt, pepper, and desired spices. 10. Add mixture to each pepper. Make sure to fill to the top. 11. Sprinkle 1/2 cup mozzarella cheese over the top of each pepper. 12. Cover pan with foil. Bake for 30 minutes. Remove pan from oven, remove foil, and place back in oven for an additional 20 minutes. Overall, this was really yummy and filling. Next time, we would like to try it taco style, and add black beans, taco seasoning, and top it off with sour cream. Mmmm!